ATS has a student fund-raising tool that presents an opportunity to our students to raise funds towards their personal tuition fees. Directly from a SA bank account. Payments can be made once-off or on a recurring monthly basis. Follow the 6 easy steps below in order to make use of ATS' student fund-raising tool. Sign up or log in via Facebook by clicking on the Facebook button. Or sign up for an "Activist" account by clicking on the blue "right here" text. Fill in your details and click the "Create Account" button at the bottom of the form. To create your personal study fundraising page, click "Create your first fundraising project" under the heading ACTIONS REQUIRED. Fill in the amount you'd like to raise. Typically, you'd enter the amount that your course will cost you for the year. Set your project to be open for donations for "3 Months". For your project name, enter your own name. what God's calling is for your life. Tip: Remember that you're going to approach business people, church members, family and friends to donate towards your tuition fees so you should shortly give them a motivation of why they should support you. Tick the box next to "Send a thank-you message to your project's donors". Enter a personal message of thanks in this area. Your donors will receive an email with this message once they've donated. Click the "Create Project" button. Tip: Remember to "Like" your page on Facebook and click "send" to email it to your potential donors. Your personal study fundraising page (project) has now been created. You can "upload your picture" (a big friendly smile might help) or "Find people your know" to kickstart your campaign. Click on the "Read more & support this project" button to view your project. You're on the "Donate Now!" page. There is a big red button for people to donate towards your tuition fees. This is the page you want to send people to. Copy the web address in the top of your browser, paste it in your email and send it to your potential donors. As a registered student you remain responsible for your full tuition fees. With this platform, ATS aims to provide you with a tool to help you in raising funds for your tuition fees. You'll have to actively meet people and ask for their contribution in order for this to help you. Talk to business people, people in your community, church, family and friends. Ask them to contribute to your professional development instead of buying you a Christmas or birthday gift. The funds raised through this platform is paid to ATS' registered bank account and are not paid to the student's personal bank account. The amount raised by a student is deducted from his/her student account at ATS. Should a student raise more funds than the yearly tuition fees, then the surplus is carried over to the following year. If the student is in his/her final year, then the surplus is automatically allocated to the ATS bursary fund to financially help other students. Should the student, for any reason, cancel his/her studies, then the remaining amount is automatically allocated to the ATS bursary fund to financially help other students. 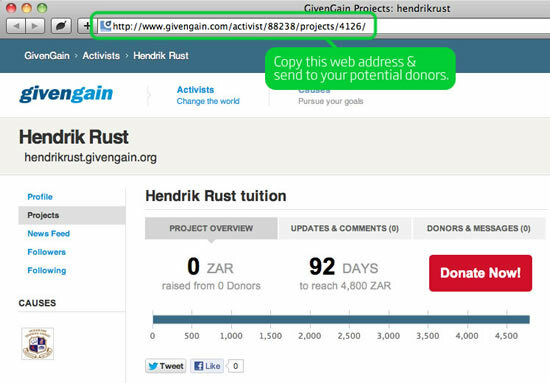 The funds raised through the GivenGain platform will not be paid out to a student.